A couple of years back, I had a dream of a budget carry gun that was tough and effective. Basically what I wanted was a pistol I would not have to worry about getting beat up in the environment of a Jeep's floorboards. I was envisioning a gun that would be reliable protection against a carjacker, that could rest on the passenger seat under a newspaper if necessary, and be carried at other times in a holster or on the floorboard behind the passenger seat. Initially I was thinking .357 revolver. It's the most reliable gun out there. In the floorboard environment, however, it could easily end up with crap jamming the cylinder, preventing it from rotating and firing that first shot. A revolver was out. I began to think custom 1911. What I ended up with was that, and more. Because I'm cheap frugal I resolved to build this pistol myself. I could have used a Springfield GI45 as a base gun, but I found two Sistema Colts at a gun show for $450. I purchased them both. Both Sistemas were in pretty rough shape, but structurally sound. I chose the worst of the two for my project. This pistol underwent a slow metamorphosis into a 1911 that may not be beautiful, but one that is beautifully adapted to the job at hand. The first improvement on this gun was the trigger. I had to eliminate myself from the accuracy equation as much as possible. The pistol would shoot, but it shot 8 inch groups. A cheapo trigger job pulled those groups down to 6 inches. I ordered a Wilson barrel and bushing, along with other items. The Wilson barrel not only provides exceptional accuracy, it allows hollow point ammo to feed without jamming. Along with the Wilson barrel, I installed an Ed Brown grip and thumb safety as well as an Ed Brown slide stop. A Nowlin sear, disconnect and springs, McCormick trigger and Colt Commander hammer provide the ignition. The pistol also received a flat mainspring housing. I screwed rubber double diamond grips to the pistol's sides. I use Wilson 47D magazines in this pistol. The two unusual decisions I made were to retain the original GI ejection port and GI sights. The pistol ejects through the little GI hole with no problem, and I rationalized that the smaller port will let less grit into the area of the barrel's linking system. I was originally planning on Novak low profile sights. When testing the pistol with GI sights however, I found them reasonably easy to acquire. More importantly, I found them to be extremely precise due to the lesser width of the front blade. I used a needle file to open the rear notch a bit, and I dabbed some day glow paint on the front half moon blade. I rationalized the semi circular front blade would be less likely to snag on seat belts, clothing or other items, lessening the chances of an impeded draw. After using the pistol for several weeks, and stuffing it in my belt Mexican style to prevent it being left in the car, I installed a Clip Draw device. I have found this device to work very well for short jaunts. For extended carry, I prefer a holster. I shot this pistol with next to no finish for half a season. One of my shooting buddies, who is a diehard Wilson Combat man began to call my low buck shooter a tightwad Wilson. It miffed him that my Modelo 1927 Sistema could match his Wilson CQB in accuracy. 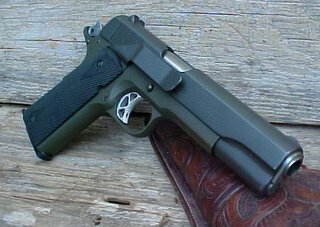 Finally, realizing that I couldn't shut him up, but I could join him, I decided to finish the pistol in a two tone Wilson Combat style finish. I had a local gunsmith bake on an Armor Coat type finish with an olive drab lower and a gunmetal grey upper. This is what I call a custom gun. It is not an off the shelf gun in any way. It's not fancy, but it is one of a kind. Each component was chosen with a specific need in mind. Nothing was done because it was the fashionable thing to do, with perhaps, the exception of the finish. It is accurate, fast and effective. Like a '32 Deuce Roadster with a hopped up V8, and a flat black paint job, it is an unpretentious performer. I like that. I've read that article several times, and sent others to it for education and edification. I will politely disagree with your statement that it "may not be beautiful". Beauty is in the eye of the beholder, but I think the finish you put on it is right handsome, and a fine piece of machinery that functions well has it's own beauty. If I ever decide to "tune up" my M1991A1 Commander, I'll likely use your various articles as starting points. Thank you for the education and for the entertainment. Very informative. The GeoCities link was also interesting. Thanks. I like that it's unpretententious and not showy. 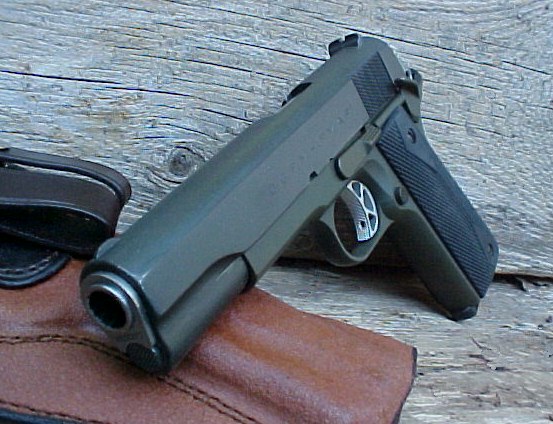 To me, the 1911 is one of those classic designs that nobody has ever improved, however much tinkering they do. I don't even care for slanted grip grooves on the slide, and grooves on the front end of the slide are right out! So I'd say your Systema is just as perfect as it could be without the Colt logo. I regret that I couldn't find an e-mail address on your web site, so I'm posting here in your comments in the hope that might take the time to reply. I own several 1911-style pistols, and with my relatively small hands have had great difficulty in reaching the slide-stop lever with my thumb to close the slide (chambering a new round) after a magazine reload. While I've found that I don't need an extended thumb safety, an extended slide-stop lever proves extremely useful. Do you have any comments on the usefullness of extended slide-stops for people with small hands? It has been my experience that the heavier extended slide stops tend to bounce up under recoil creating mid magazine lock-ups. This is so common that I cannot advise anyone to use extended slide stops. Very few people have thumbs long enough to use the standard slide stop with the right hand. What I and many others do instead is use the weak hand thumb to release the slide on a new magazine of ammo after a reload, as the weak hand comes into it's grip across the strong. After all, that left thumb is right there handy after using the left hand to slam a fresh magazine into the gun. Of course one handed people may be limited, but they would have a problem getting a fresh magazine in the gun anyway. Thank you for the feedback. I've put extended slide-stops on a couple of my Springfields, and have never had the "bounce-up" problem you mention. I've got one older Springfield in stainless, purchased it used (at least 10 years ago) with a nice set of Bomar sights and a beveled magazine well. The extended stop works quite nicely there. I was considering putting one on my carry .45, a Springfield Micro-Compact, but it stuck out a little too much, and I didn't want to suffer a snag. That short-barreled auto sits quite nicely in a Don Hume IWB holster (with a thumb-break strap between the hammer and slide, since I'm kind of a weinie when it comes to carrying a cocked-and-locked 1911). It doesn't look as nice as the beautiful one in your previous post. Thanks again for troubling to reply. Not a prob Blackwing! If the extended stop works for you, it works! what is this day glow paint you speak of? I have a SA GI and acquiring sight picture is slow under stress. love the rest of the gun, just have issue with that front sight post, but don't want to have it dovetailed out for anything fancy. thanks for any help and for all the great articles. Great post! It gives me hope for my first 1911 (Armscor Govt Model). It's going to be a no frills carry gun. I went back and got another clip draw for my Colt Govt. 1991A1 after I got rid of another gun I had installed one on. I have a Colt 1991 compact I carry IWB in a custom made kydex holster, but I also wanted a quick "grab 'n' go" set up, this artical sold me on the clip draw again. Xavier is a Registered Nurse who specialized in complex wound care. He has practiced for over fourteen years in his community. He often provided nursing service in areas where law enforcement refused to enter without back-up. Xavier now works in surgery. Xavier has been an avid shooter for over 30 years. He strongly supports the 2nd Amendment, opposes gun control of any sort, and carries a weapon 24 hours a day. Xavier is known on various internet gun forums as XavierBreath. He is married with three children, and is moderated by an apathetic one eyed cat, a goofy Golden Retriever, and a stalwart German Shepherd Dog. One day, he hopes to be deserving of them all. treatmewithbenignneglect@gmail.com He might read your email. He might delete it on sight. He might publish it and comment on it. This is a Flickr badge showing public photos and videos from Xavier Shots. Make your own badge here.